Three Republicans stopped a methane rule rollback. They must continue to buck Trump. A measure to nullify a rule from the Obama administration that sought to reduce methane emissions was expected to pass the Senate on Wednesday. 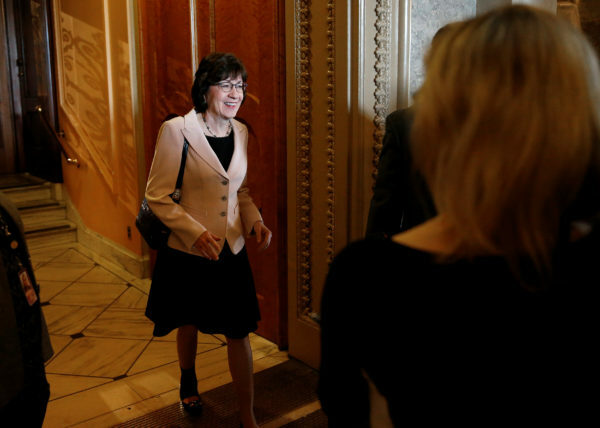 Instead, the measure failed when three Republicans, including Sen. Susan Collins, voted against it. Congress had 60 days to review the rule, which would limit the amount of natural gas that can be vented or flared on federal and tribal lands. That time has lapsed, so the rule will remain in effect. This will reduce methane pollution, protect Americans taxpayers and save oil and gas companies money. This surprise vote highlights the importance of lawmakers, particularly Republicans, standing up to the Trump administration as it seeks to weaken U.S. laws and to circumvent oversight and scrutiny of its actions. The rollback had previously been passed by the House. Rep. Bruce Poliquin, a Republican, voted for it. Democrat Chellie Pingree voted no. Sen. Angus King voted no in the Senate. It also shows that the Trump administration’s plan to gut dozens of environmental protection and climate change measures can be slowed by lawmakers who put the wellbeing of Americans ahead of party loyalty. In addition to Collins, fellow Republican Sens. John McCain of Arizona and Lindsey Graham of South Carolina voted against the rule rollback, which failed on a 49-51 vote. McCain was most troubled by the fact that if the methane rule were repealed by Congress, the federal government would be permanently barred from issuing similar regulations. The aim of the Bureau of Land Management rule, which was put in place in the final weeks of the Obama administration, was to ensure that as much methane as possible is captured and sent to processing facilities to become part of the nation’s natural gas supply. It was modeled after rules developed by the state of Colorado. Natural gas is flared, or burned, when a drilling operation extracts more gas than it can handle or when the operation is focused on extracting oil. With equipment changes, more gas could be captured rather than wasted. BLM estimates that about 462 billion cubic feet of natural gas were flared or leaked on public and tribal lands between 2009 and 2015. That’s enough gas to supply more than 6 million homes a year, it said. This gas would be worth $330 million if it were processed and sold. The revenue from selling this gas would surpass the cost of upgrading equipment by at least $115 million a year, according to BLM. Underground natural gas and oil on federal land belongs to the American people. When it is extracted and sold, the federal government, states and tribes receive royalties. The BLM estimates that Americans lose $23 million annually in royalties on natural gas that is flared or leaked into the environment. There are also climate change concerns. Methane, a major component of natural gas, is much more effective at trapping the Earth’s heat than carbon dioxide, making it a powerful contributor to climate change. One third of the nation’s methane emissions come from oil and gas operations. So, capturing more methane is better for the environment and the long-term health of humans. For all these reasons, the new methane rule, issued by the BLM in November, made sense. The Trump administration is seeking to weaken regulations on oil and gas extraction through other avenues, so continued vigilance is needed. But the methane rule shows the value of strong-willed Republicans willing to rein in a dangerous president and administration.